Charity should be an integral part of every business in their participation in the wider community. Emma Lovell runs her PR, Marketing and Social media business Lovelly Communications. As part of her business, Emma actively takes part and contributes to charity and community events. It’s not just corporate social responsibility, its love thy neighbour and looking out for our fellow human beings. Lovelly Communications is a big supporter of World Vision and the wonderful work they do. After sponsoring one child for 5 years and visiting his village in Tanzania, we have made a commitment to child sponsorship. We now sponsor a Nepalese Girl and enjoy watching her grow and develop and plan to again visit her in the coming years. Emma is now also a #WVABloggers Blog Ambassador. You will notice that she regularly contributes articles here and on her Adventures of the Traveller Em website. She went on a blogger tour in November 2014 to Uganda to see first hand the work of World Vision Australia. In 2015, Emma will raise $2015 for 2015. 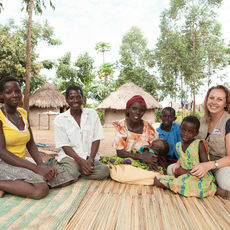 You can help Emma raise $2015 to support Tanzanian street kids with education, care and protection. Director of Lovelly Communications, Emma Lovell, took on the Peru Challenge in October 2012, Climbing Machu Pichu for Black Dog Institute, awareness and research for mood disorders. Black Dog Isntitute is an educational, research and clinical facility offering specialist expertise in mood disorders. All funds go to Black Dog Institute and their amazing efforts. Lovelly Communications ran the Social Media and Newsletter with RedHands Organisation in Australia from December 2011- July 2012. Lovelly Communications remains a strong supporter of this amazing network of women who aim to empower and enrich the lives of women in developing countries all over the world. Our mission is to empower women living in poverty in developing countries achieve financial independence, self esteem and confidence through funding and supporting the creation of their own small businesses.